A 1988 Canadian study of houses with urea-formaldehyde foam insulation found that formaldehyde levels as low as 0.046 ppm were positively correlated with eye and nasal irritation. A 2009 review of studies has shown a strong association between exposure to formaldehyde and the development of childhood asthma. The primary exposure concern is for the workers in the industries producing or using formaldehyde. The United States Environmental Protection Agency (EPA) allows no more than 0.016 ppm formaldehyde in the air in new buildings constructed for that agency. [not in citation given] A U.S. Environmental Protection Agency study found a new home measured 0.076 ppm when brand new and 0.045 ppm after 30 days. The Federal Emergency Management Agency (FEMA) has also announced limits on the formaldehyde levels in trailers purchased by that agency. The EPA recommends the use of "exterior-grade" pressed-wood products with phenol instead of urea resin to limit formaldehyde exposure, since pressed-wood products containing formaldehyde resins are often a significant source of formaldehyde in homes. ^ a b "SIDS Initial Assessment Report" (PDF). International Programme on Chemical Safety. Archived (PDF) from the original on 2019-03-28. Retrieved 2019-04-21. ^ Spence, Robert; Wild, William (1935). "114. The vapour-pressure curve of formaldehyde, and some related data". Journal of the Chemical Society (Resumed): 506–509. ^ "PubChem Compound Database; CID=712". National Center for Biotechnology Information. Archived from the original on 2019-04-12. Retrieved 2017-07-08. ^ "Acidity of aldehydes". Chemistry Stack Exchange. Archived from the original on 2018-09-01. Retrieved 2019-04-21. ^ Nelson Jr., R. D.; Lide, D. R.; Maryott, A. A. (1967). "Selected Values of electric dipole moments for molecules in the gas phase (NSRDS-NBS10)" (PDF). Archived (PDF) from the original on 2018-06-08. Retrieved 2019-04-21. ^ "Substance Name: Formaldehyde [USP]". ChemlDplus, US National Libary of Medicine. Archived from the original on 2017-09-18. Retrieved 2019-04-21. ^ a b Harris, Gardiner (2011-06-10). "Government Says 2 Common Materials Pose Risk of Cancer". New York Times. Archived from the original on 2019-03-28. Retrieved 2011-06-11. ^ a b National Toxicology Program (2011-06-10). "12th Report on Carcinogens". National Toxicology Program. Archived from the original on 2011-06-08. Retrieved 2011-06-11. ^ a b National Toxicology Program (2011-06-10). "Report On Carcinogens - Twelfth Edition - 2011" (PDF). National Toxicology Program. Archived from the original (PDF) on 2011-06-12. Retrieved 2011-06-11. ^ "Formaldehyde Is Biodegradable, Quickly Broken Down in the Air By Sunlight or By Bacteria in Soil or Water" (Press release). Formaldehyde Panel of the American Chemistry Council. 2014-01-29. Archived from the original on 2019-03-28. Retrieved 2017-04-22. ^ Butlerow, A (1859). Ueber einige Derivate des Jodmethylens [On some derivatives of methylene iodide]. Annalen der Chemie und Pharmacie. 111. pp. 242–252. 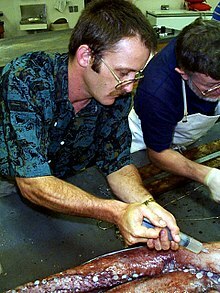 In this paper, Butlerov discovered formaldehyde, which he called "Dioxymethylen" (methylene dioxide) [page 247] because his empirical formula for it was incorrect (C4H4O4). ^ "Formaldehyde in Clothing and Textiles FactSheet". NICNAS. Australian National Industrial Chemicals Notification and Assessment Scheme. 2013-05-01. Archived from the original on 2019-03-19. Retrieved 2014-11-12. ^ "Ingredients of Vaccines - Fact Sheet". Center for Disease Control. Archived from the original on 2019-04-21. Retrieved 2018-08-04. Formaldehyde is used to inactivate bacterial products for toxoid vaccines, (these are vaccines that use an inactive bacterial toxin to produce immunity.) It is also used to kill unwanted viruses and bacteria that might contaminate the vaccine during production. Most formaldehyde is removed from the vaccine before it is packaged. ^ "§573.460 Formaldehyde". U.S. Government Publishing Office. 2019-04-19. Archived from the original on 2019-04-23. ^ Patel, Alkesh (2007-07-04). "Formaldehyde Ban set for 22 September 2007". WebWire. Archived from the original on 2018-12-12. Retrieved 2012-05-19. ^ "Process C-41 Using Kodak Flexicolor Chemicals - Publication Z-131". Kodak. Archived from the original on 2016-06-15. Retrieved 2009-09-01. ^ "Medical Management Guidelines for Formaldehyde". Archived from the original on 2019-04-23. ^ "Indoor Air Pollution in California" (PDF). Air Resources Board, California Environmental Protection Agency. July 2005. pp. 65–70. Archived (PDF) from the original on 2019-03-01. Retrieved 2012-05-19. ^ "Formaldehyde". Occupational Safety and Health Administration. August 2008. Archived from the original on 2019-04-11. Retrieved 2009-09-01. ^ "Formaldehyde Reference Exposure Levels" (PDF). California Office Of Health Hazard Assessment. December 2008. Archived from the original on 2019-03-23. Retrieved 2012-05-19. ^ "Formaldehyde and Indoor Air". Health Canada. 2012-03-29. Archived from the original on 2019-04-23. ^ Lobachev, AN (1978). "РОЛЬ МИТОХОНДРИАЛЬНЫХ ПРОЦЕССОВ В РАЗВИТИИ И СТАРЕНИИ ОРГАНИЗМА. СТАРЕНИЕ И РАК" [Role of mitochondrial processes in the development and aging of organism. Aging and cancer] (PDF) (in Russian). VINITI. Archived (PDF) from the original on 2013-06-06. ^ IARC Working Group on the Evaluation of Carcinogenic Risks to Humans (2006). IARC Monographs on the Evaluation of Carcinogenic Risks to Humans - VOLUME 88 - Formaldehyde, 2-Butoxyethanol and 1-tert-Butoxypropan-2-ol (PDF). WHO Press. ISBN 92-832-1288-6. Archived (PDF) from the original on 2018-07-12. ^ a b "Formaldehyde and Cancer Risk". National Cancer Institute. 2011-06-10. Archived from the original on 2019-01-23. ^ "Key Statistics for Nasopharyngeal Cancer". American Cancer Society. Archived from the original on 2019-01-11. Retrieved 2019-04-22. ^ "Key Statistics for Chronic Myeloid Leukemia". American Cancer Society. Archived from the original on 2019-04-23. Retrieved 2019-04-22. ^ "What are the key statistics about acute myeloid leukemia?Key Statistics for Acute Myeloid Leukemia (AML)". American Cancer Society. Archived from the original on 2019-04-23. Retrieved 2019-04-22. ^ Butticè, Claudio (2015). "Solvents". In Colditz, Graham A. (ed.). The SAGE Encyclopedia of Cancer and Society (Second ed.). Thousand Oaks: SAGE Publications, Inc. pp. 1089–1091. doi:10.4135/9781483345758.n530. ISBN 9781483345734. ^ "Risk Factors for Acute Myeloid Leukemia (AML)". American Cancer Society. 2018-08-21. Archived from the original on 2019-04-23. ^ "Risk Factors for Chronic Myeloid Leukemia". American Cancer Society. 2018-06-19. Archived from the original on 2018-12-12. ^ "Formaldehyde Emission Standards for Composite Wood Products". EPA. Archived from the original on 2018-12-24. Retrieved 2019-04-24. ^ Passmore, Whitney; Sullivan, Michael J. (2016-08-04). "EPA Issues Final Rule on Formaldehyde Emission Standards for Composite Wood Products". The National Law Review. Womble Carlyle Sandridge & Rice, PLLC. Archived from the original on 2018-06-19. Retrieved 2016-08-24 – via Google News. ^ Zug KA, Warshaw EM, Fowler JF, Maibach HI, Belsito DL, Pratt MD, Sasseville D, Storrs FJ, Taylor JS, Mathias CG, Deleo VA, Rietschel RL, Marks J (2009). 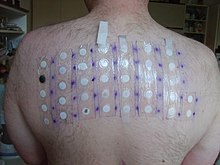 "Patch-test results of the North American Contact Dermatitis Group 2005-2006". Dermatitis. 20 (3): 149–60. PMID 19470301. ^ "Formaldehyde allergy". DermNet NZ. New Zealand Dermatological Society. 2002. Archived from the original on 2018-09-23. Retrieved 2019-04-25. ^ Hayashida, Mike. "The Regulation of Cosmetics in Japan" (PDF). Archived (PDF) from the original on 2019-04-14. Retrieved 2019-04-25. ^ "Formaldehyde CAS 50-00-0" (PDF). United Nations Environment Programme. Archived (PDF) from the original on 2019-03-28. Retrieved 2019-04-25.